Public funds should go to critical frontline staff who can address trauma and root causes of violence, instead of promoting practices that criminalize youth and undermine school cultures. CHICAGO, September 12, 2018—Chicago Teachers Union President Jesse Sharkey issued the following statement today in response to the City of Chicago Office of Inspector General’s report on policing in Chicago’s public schools. “Since Emanuel took office, Chicagoans have forked over $150 million – roughly $13 million a year – to pay for police in our schools, not including over two million dollars between 2012-16 alone in CPS misconduct settlements for police activities on and off school grounds. Yet they have no specialized training, no clear standards, no oversight and zero accountability. Those dollars each year should instead fund wrap-around services that include social workers, counselors and other critical professional staff equipped to help students address behavioral issues, violence and trauma. “CTU educators have endured months of fingerprinting and background checks to reaffirm our fitness to work with children. Yet for police in schools, no such standards exist. Instead, the mayor and his board put students’ civil rights at risk and undermine their access to the very professionals who could help them carve out a path to successful adulthood. “Thousands of Black and Brown students live in neighborhoods with high unemployment, lack of affordable health care and housing, intense pressures from poverty and displacement, and generations of chronic disinvestment. Too many of our students suffer from trauma. Every student needs a sustainable community school with counselors, social workers, certified school nurses, psychologists and wrap-around services that will help them grow into productive adults. Their schools deserve the resources it takes to put youth on a path to lifelong learning and fulfilling lives. Our city deserves a school district that is accountable, transparent, responsible and committed to the welfare of ALL our students. 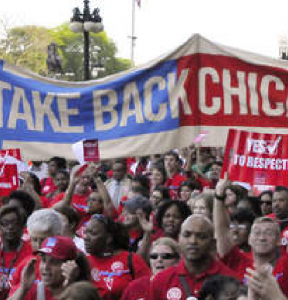 The Chicago Teachers Union represents nearly 25,000 teachers and educational support personnel working in schools funded by City of Chicago School District 299, and by extension, the nearly 400,000 students and families they serve. 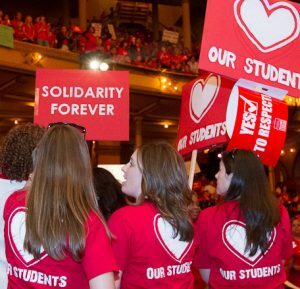 The CTU is an affiliate of the American Federation of Teachers and the Illinois Federation of Teachers and is the third-largest teachers local in the United States. For more information, please visit the CTU website at www.ctunet.com.